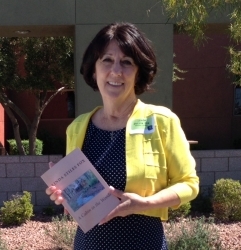 Long time, local author, Linda Stiles Fox will be remembered this Saturday as the Henderson Libraries' Local Author Showcase will be dedicated in her memory. The event is being held this Saturday, March 23, 2019 at the Paseo Verde Library in Henderson, NV. Linda lost her battle with Carcinoid Cancer November 27, 2018. Las Vegas, NV, March 20, 2019 --(PR.com)-- Las Vegas and Henderson, Nevada author, Linda Stiles Fox is being remembered by the Henderson Libraries on Saturday, March 23 when the annual Local Author Showcase takes place. The event will be dedicated in loving memory of Linda. Linda was a long time resident of the Las Vegas valley. She began writing at an early age, but it wasn't until she penned, "A Cabin in the Woods," that she received recognition of her talents. With numerous titles now on Amazon, she has become well known not just in Las Vegas, but her books have sold all over the world. Her romantic romps like, "Reflections of the Heart" and "Never Too Late" have become fan favorites. But it was her Island Love Trilogy where her talents really shined. "Forever Again" is the first volume. It seems to take the reader on an adventure to the Hawaiian islands, on a suspense filled beginning to an untold love story. The second book, "Forever Begins" continues where "Again" left off. Sadly, Linda passed away before penning much more than the prologue to "Forever and Always." Linda became well know in the writing community and along with Vicki-Ann Bush began the Coffee House Tours. What started out as a few book signings with Linda and Vicki-Ann became a calendar full of noted local authors touring local coffee house venues to sign their books and mingle with the public. Linda Stiles Fox lost her long fought battle with Carcinoid Cancer on November 27th, 2018. She was a strong advocate for any kind of preventative screening and urged everyone she came into contact with to get checked out. Her particular cancer was rare and isn't diagnosed often. Linda loved writing and reading and often visited adult care facilities and schools to read and share. One of her sayings was, "Don't forget to read!" The decision to honor Linda by dedicating this years 6th annual Local Authors Showcase is overwhelming to Linda Stiles Fox Books and its staff.